After a Saturday road trip to the northern part of Nueva Ecija going to Nueva Vizcaya, Dong Ho, Orlan and I, now head to the eastern part of Nueva Ecija going to Aurora. 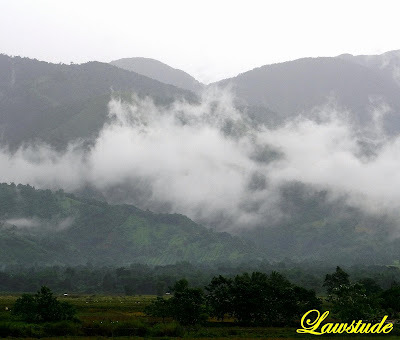 From Cabanatuan, where Dong Ho, Orlan and I spent the night, we woke-up early to catch the early morning mountain-mist of Sierra Madre Mountain Range. Our itinerary for this Sunday is to see much of what we can in this road trip from Cabanatuan to Dingalan, Aurora. I must admit, although I am from this area and have passed through this route several times, still, the prospect of discovering new things thrill me. 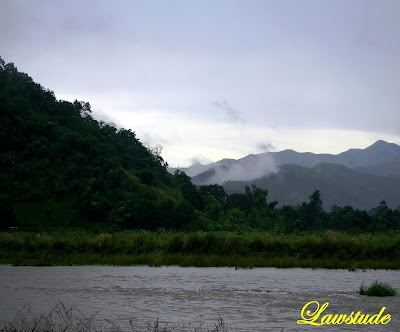 The landscape in Cabanatuan City and Palayan City is very plain but once you enter the towns of Laur and Gabaldon, you will be awed by the mighty presence of the Sierra Madre Mountain Range in the roadside. 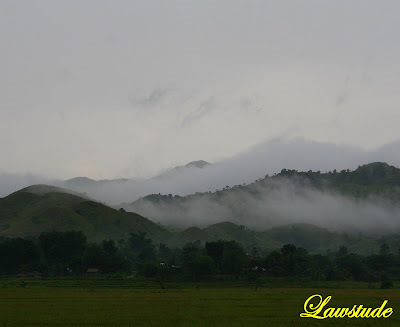 The gentle rain showers also added to the misty effect of the place as fogs envelope the tips of the mountain. 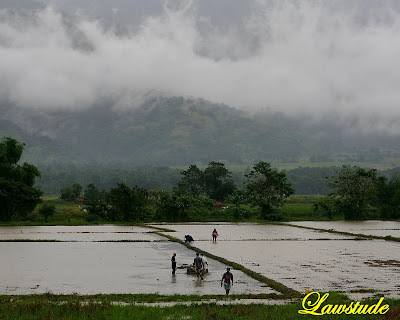 Farming is still the primary source of livelihood in the area. To go to Laur, you need to go first to Cabanatuan City Central Transport Terminal where there are passenger jeeps that departs (when passengers have filled the jeepneys)heading to Laur. Alternately, you can ride a bus going to Dingalan and asked the driver to drop you to Laur. There are also lots of private vehicles for hire in Cabanatuan City that will take you to Laur. 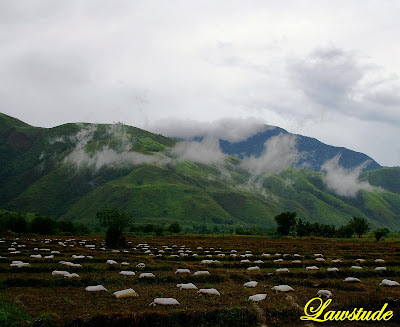 Please check also my travel buddy Dong Ho's post about Scarp Slopes of Laur here. LS: Amazing captures of the area. The way the green mountains turn blue in the distance is really neat. This was a great photo trip. another outstanding photos captured by your mighty hands attorney..
i miss the blogworld, i was away for quite a long time! These are not the kind of pictures I'm accustomed to seeing here, but they are wonderful just the same. I love the color and misty clouds. Very beautiful scenery especially the mountain. At first glance, I thought the many sacks of fertilizer are sheeps...lol. Oh boy, I need to have my eyes check. Have a nice weekend, Lawstude. You have some awesome shots here. Sorry I haven't been around much....it must be that time of year when we are all so busy with our jobs! Thanks for dropping in....your place looks very very appealing! Wow!! !amazing how i wish i join you guys. Beautiful mountains. I love the way the mist/fog hangs onto them like that - very dramatic. An awesome trip to share with your friends! Breathtaking talaga ang view! nature healing talaga. The mountains are so beautiful Thanks for taking us along on your trip. This is a very nice blog and I love your beutiful and natural pictures! If not, you might want to wisit one of my blogs! 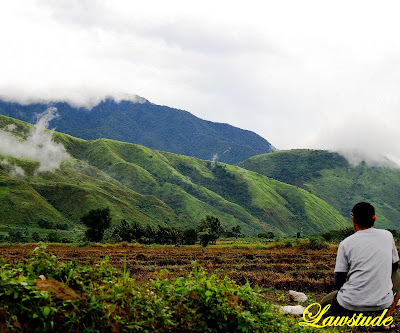 Great captures of the area, Lawstud! I so love your tropical photos - they're so beautiful & you can't let work take over you too awful much, you have to keep us up to date w/ your photos! Thanks for stopping by the other day - I actually thought you had abandoned blogging, so I deleted you off my list! But... you're back on now & I'll keep you there! I love your pics~!!! life of a photographer: morning wake-ups, and a good cup of coffee. i got myself a try of this, hubby and his friend went to Gumasa, Glan, 2 hours from where we are located, 5 of us, the friend's wife, me the 2 photographers and their amily driver, all woke up at 2 am to catch the sunrise after that 2 hour drive. Very green and nice captures of the whole area! You're back... with more pictures! :) Ang kapal ng fog. Mukha na syang ulap. awesome shots! 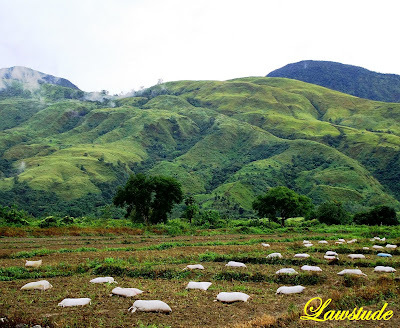 the 4th photo is so beautiful, the clouds almost touching the mountains and sacks of fertilizer on the ground. great composition! I'm glad to see you back to blogging. My fave is the one with the farmers. 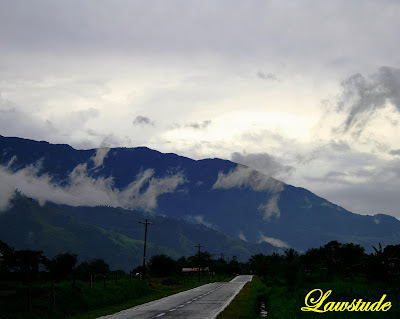 After being stranded in CDO for 3 days parang nagkaphobia nako makakita ng mountain mist kse bka makansel nanaman flight namen :) Bket kse kelangan sa gilid ng bundok magtayo ng runway at airport??? Welcome Back Lawstude. The mountain looks so refreshing. Hayyyy. you guys have this weird talent for turning the most mundane things into something spectacular. are all backpackers like this? astig pa rin kuya ah! yan kahit paambon ambon picture pa rin. ganda ng effect nung mga sako sa field. hinding hindi ko malilimutan itong byaheng to. I love the first one !